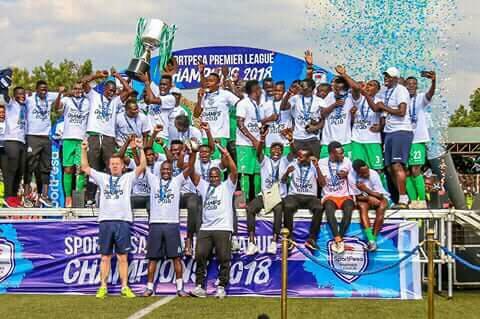 Gor Mahia and Mathare United settled for a 2-2 draw at Kisumu during the formal coronation of the 2018 Kenya Premier League title. Prior to the coronation, the defending champions were held to a 2-2 draw by a hard-fighting Mathare United at the same venue in their penultimate match of the 2018 season. Rwandese import Jacques Tuyisenge and Humphrey Mieno were on target for Gor while Mathare’s goals were scored by substitute Klinsman Omulanga and Cliff Nyakeya. Like the norm with Gor’s supporters, they turned in their numbers with all kinds of paraphernalia, painting the Lake side city green before converging at the stadium, to witness their team’s coronation for the 17th time. K’Ogalo had successfully defended the title with six games to go, and Sunday’s draw takes their points tally to 72. And when skipper Harun Shakava lifted the trophy aloft after receiving it from Odinga, the jubilant fans responded with a rapturous roar, paying tribute to the Dylan Kerr-led team after another year of unmatched dominance. Looking to put a smile on their supporters faces after their recent poor run, K’Ogalo begun the encounter strong, taking a deserved lead after nine minutes through Tuyisenge. The Rwandan easily slotted the ball into the back of the net with a low drive to the left of the goal post, after finding himself with Mathare’s goalkeeper Job Ochieng as the only man to beat. The forward was on his way to adding a second a few minutes later but he flagged offside, before Mathare threatened to cancel the host’s lead from the right wing. The early goal seemed not to have dampened the visitors spirits as they took the game to Gor’s side, forcing Kerr’s defenders led by skipper Shakava to be alert. David Owino reacted fast to save Mathare from conceding a second goal in the 24th minute when he cleared the ball from Ephrem Guikan legs, just when the Ivorian was preparing to strike with his left foot. George ‘Blackberry’ Odhiambo was unlucky with his 35th minute attempt from the left as it missed the target by a few inches, with Ochieng already beaten, before Tuyisenge’s header went off target. Mathare head coach Francis Kimanzi was the first to make a change, bringing in Omulanga for Clifford Alwanga in the 49th minute, but, it was not long before his side fell 2-0 down. Mieno turned well to beat Ochieng with a shot from the centre of the crowded box, after collecting a loose ball from George Odhiambo’s delivery from a corner. Mathare then created two successive chances but were denied by Fredrick Odhiambo’s at Gor Mahia’s goal who had not been tested for the better part of the duel. Substitute Omulanga halved Gor’s lead in the 69th minute with a cool finish that hit bar before crossing the line, before goal keeper Odhiambo made another crucial save to deny his former employers an equaliser. Kerr made a double substitution two minutes later, resting George Odhiambo for Francis Mustafa and Charles Momanyi for the injured Rafael Asudi. A mistake by defender Joash Onyango to push Omulanga when he went up inside the box to head the ball cost Gor the win as Nyakeya made no mistake from the spot nine minutes from time. Kerr decried the manner in which his side gave away the win but thanked the players for clinching the title despite the tight scheduled that they had. “We were on top of things but conceded two goals which ought not to have happened because we came in Kisumu to win and thank our fans for their support,” said Kerr. When Odhiambo and Asudi were withdrawn we became so vulnerable, something must be done to this left side.Gor has no left back capable of neutralizing opponent’s right wingers.These so called ‘dignitaries’ only show up to be part of the victory party but are nowhere to be seen when players are suffering.True hypocrites indeed. Shakava, too proud he shd be released, Onyango, too inexperienced he commits too many mistakes, Nzighirimana yuko sawa. I feel gor mahia need a goalkeeper, 2 central defenders, left back, 2 midfielders and a striker. Players to be released. Shakava, wendo, bonnie gk, Guikan. A source from AR and so reliable. Gor mahia is chasing Baba Kizito, Danny Ssrekuma and Kalid Aucho. Is this an advice from the technical bench? Dylan Kerr has told Gor Mahia players to brace themselves for tough times as a fuming Briton tore into his players following a shoddy performance against Mathare United. Gor Mahia surrendered a two-goal lead to settle for a 2-2 draw with Mathare United; a performance that watered down the coronation ceremony at the Moi Stadium, in Kisumu, after K’Ogalo were officially handed their 17th Kenyan Premier League title on Sunday. Kerr singled out Joash Onyango for criticism after the defender conceded a penalty late in the second half to allow Mathare United draw level after Klinsmann Omulanga came off the bench to bring the former champions back in the game with his second goal of the season for the ‘Slum Boys. Onyango was even lucky to avoid a similar mistake earlier on when he brought down Clifford Alwanga in the box but the referee was courteous enough to call for a corner. Gor Mahia had taken the lead through Jacques Tuyisenge before Humphrey Mieno seemed to have sealed the fate of Mathare until Omulanga rose from the bench to inspire Mathare to the draw. Kerr, in a post-match interview, questioned Onyango’s intelligence after he committed the costly mistake that denied Gor Mahia fans the joy of witnessing a record crown being presented to the players by club patron and Kenya’s opposition leader and political doyen, Raila Odinga. “We were lackluster in the second half. As a substitute, you have to show me something when you are brought into the game. Some of these players think that they have a right to play in that team. Definitely Not under me. “We will have only 18 players to pick for Everton trip, not like the Tanzania trip where we had to go with 24 and for that reason, you have to give me a reason to pick you. You’ve got to show me something,” an irritated Kerr said. Gor Mahia will conclude their season with a game against Tusker before packing for a trip to Liverpool, England, where they are scheduled to play Everton in a friendly match. @Jasego, I am in total agreement with Dylan Kerr on players that should not be part of the team in 2019. Joash Onyango has never learnt anything from his past costly mistakes within the penalty areas. Many penalties and red cards have been caused by Joash Onyango and it is time to overhaul the team in defence, midfield, and strikers. Gor Mahia coach Dylan Kerr has blasted his players after letting go a two goal lead to draw against Mathare United on Sunday. The Kenyan champions raced into a 2-0 goal lead courtesy of Jacques Tuyisenge and Humphrey Mieno before Mathare United hit back with goals from Klinsman Omulanga and Cliff Nyakeya for the game to end even. The Briton has now blamed his players for laxity that denied them a win during the day they received the trophy for winning the 2018 title. “I am not happy because too many times we have let a two goal lead go by not doing the right things. “Professional players should have a way of protecting a 2-0 lead and put the game to bed and what is more is that I had a strong team out there and they should take the responsibility. Kerr also revisited the issues by Gor Mahia players to stage a go slow, saying it affected the team’s results. “We have not had a professional way of doing our things in recent months. Training for only three days don’t mean that you are going to be okay. “All season we have been doing our work perfectly and one month later players are forced not to train. That is not acceptable,” Kerr told Goal. Gor Mahia have one match to go, against Tusker, before winding the season. @Jasego, Nyangi and her ilks should just resign to go and form their own clubs. You can’t be an official of the club and you are rocking the boat from within. Nyangi and the colorless Secretary General should be shown the door and the chairman should be put on check to instil discipline in the team and executive committee. Before we castigate Nyangi and Omondi, let’s also remember that they are the only Gor officials bold enough to inquire into the club’s financial status even as the proclaimed ‘angels’ continue embezzling finances at the expense of players’ welfare. Nyangi and Omondi keep on revealing the rot and ignore the mighty. @Odhis Muga, the duo are revealing nonsense. How do officials incite players to down their tools? THe coach has complained about Ngangi several times and it is time for her to be shipped out of the team. The players were paid their outstanding salaries and allowances but failed to win the easy match against Mathare after Gor Mahia were leading 2:0. Continue burying your head in the sand, by the time you come to your senses, the coffers will have run dry.Inciting players is bad but stealing their money is even worse.